Tongue Cancer Pictures. What does tongue cancer look like? Here are seventeen tongue cancer pictures. They show the typical appearances of many types of tongue cancer. They also show some tumors that DON'T look typical. Photos of tongue cancer can never show how the tumor feels, but hopefully they will give you an idea of what cancer of the tongue can look like, and what you should look for. One thing you will notice when you look through my list of fifteen photos is that the appearance CAN VARY A LOT. There is NOT a typical tongue cancer picture that will show you what EVERY tongue cancer will look like. ALL cancers of the tongue will start out as something very small, maybe even just a tiny irritation on your tongue, or perhaps just a very small pimple on your tongue. At some point, the surface layer of the tongue becomes very thin and starts to break down. This will be like a little ulcer or tender point. Hardly worth noticing. BUT THIS IS THE VERY STAGE when you SHOULD notice that tiny irritation, and take a good close look at it every day. If ot really IS something innocent, it will disappear within 7 to 10 days. If you have any sort of ulcer on your tongue, or anywhere in your mouth, that does not heal up within 7 to 10 days, always get it checked by a dentist or doctor. Usually, most "normal" ulcers will heal up within 10 days, at the maximum 14 days. Any longer than this, and the ulcer is NOT normal. There may be a simple explanation, such as a sharp cusp or edge on a tooth, for example. BUT GET IT CHECKED. There is more information at my cancer of the tongue page. If you are concerned about a tumor elsewhere in your mouth, you should also read mouth cancer symptoms for more about the things to look for. Each picture is credited with the source, where available. The first picture is one taken recently in my own office. 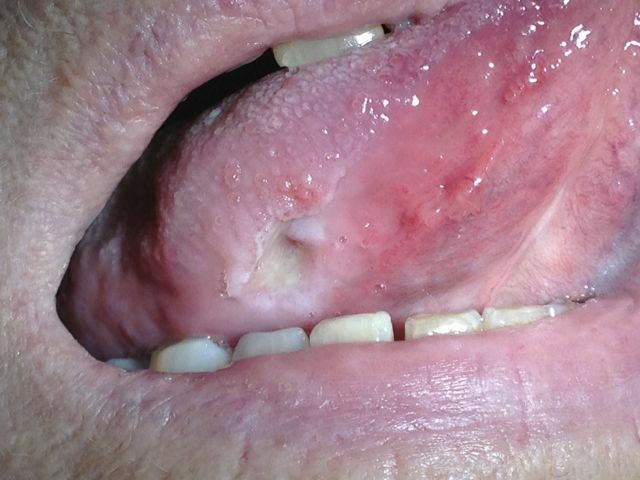 The patient had smoked cigarettes for 40 years, and noticed this ulcer under her tongue about six weeks before coming to see me. This picture above shows a very obvious cancer on the side of the tongue. This sort of cancer is relatively easy to diagnose, although a biopsy is always required to be certain. This particular tumor will have been growing slowly for some time before the photograph was taken. As a result, this is now in an advanced stage. 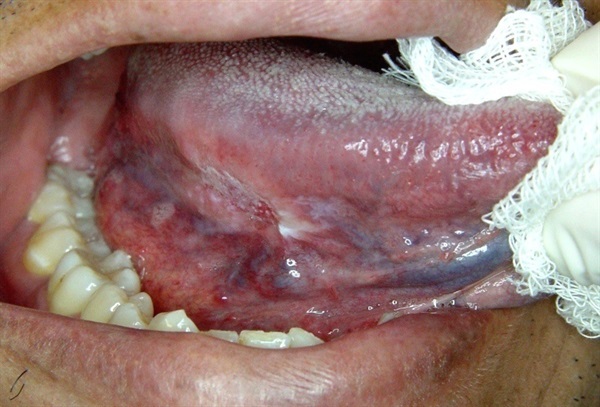 This tongue cancer picture shows the underneath of the tongue. It has the typical reddened edges with white patches, but is spread out in a diffuse manner. This type of tumor is less obvious in the early stages, and may develop to quite an advanced stage before the patient seeks medical or dental advice. 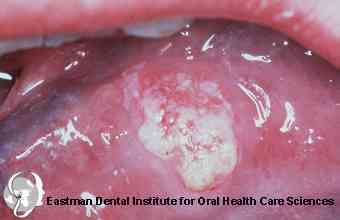 Here is a more distinct, well-outlined cancer on the side of the tongue. 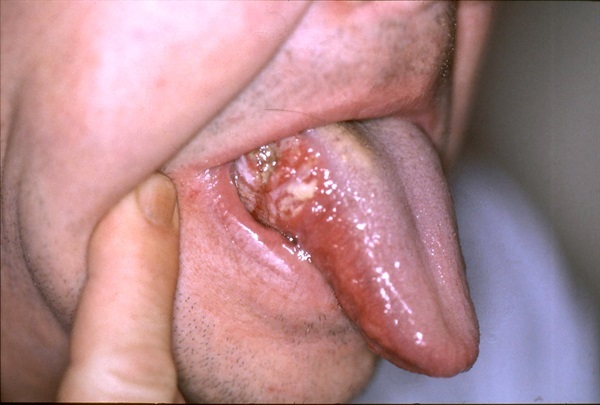 Compared to the other photos of tongue cancer on this page, it does not have red edges, but it does have the white speckled appearance that always raises concerns. Again, this has probably been developing for some time. This is a very advanced cancer of the tongue, on the underside of the tongue. This patient does not have any natural teeth, and wears full dentures. He probably thought that the sore area under his tongue was from the bottom denture rubbing on the gum. This is the most shocking of tongue cancer pictures. You have to wonder how it got so advanced before the patient got to hospital. This just shows that a tumor does not grow to a certain size and then stop. It keeps on growing and growing. To save this man's life, he probably needed to have part of his tongue removed, and a plastic surgery reconstruction. You can read more about this at my Glossectomy page. This is an excellent tongue cancer picture that shows how a tumor can start out. It look quite innocent, as if you have bitten your tongue. But if this is a tumor, it won't heal up in a week or so, it'll just carry on getting bigger. That's when you should go to your dentist or doctor as soon as possible. Here the tumor is slightly more advanced than in the previous picture. The appearance is also complicated because this patient clenches his teeth at night, and presses his tongue against the insides of the teeth. This causes a line of indentations or a "scalloped" edge along the side of the tongue. The actual tumor is the little white area just below the line of indentations on the side of the tongue. This is another one that has developed on the side of the tongue. The patient probably wondered why he kept biting his tongue by accident, and blamed the wound on this continuous accidental tongue biting. In fact, it's the tumor causing the swelling that then results in accidentally biting their tongue from time to time. In other words, the tumor came first, followed by the tongue biting. This one is slightly reddened and swollen, without the white surface of the previous tongue cancer pictures. There also seems to be some spread of the tumor under the tongue. The swelling on the side of the tongue should be very noticeable to the patient. Any swelling like this should be checked out quickly. Image courtesy Eastman Dental Institute for oral health care sciences, London. Back to the more typical appearance of a white patch with some redness around it, on the side of the tongue but also extending down underneath the tongue. Here, there is very little swelling, unlike the photo above. Without any swelling, a tumor like this can go un-noticed for some time. However, the side of the tongue will feel like it has an ulcer that doesn't go away. This is always an alarm bell to get it looked at. 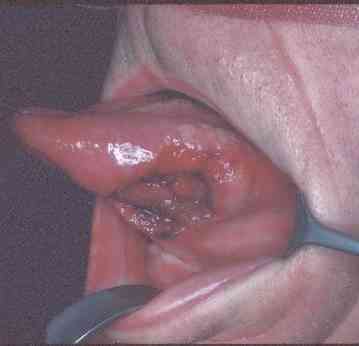 Here is a tongue cancer picture showing a tumor that is completely underneath the tongue. The patient will have been aware of some swelling under the tongue. He may have thought that it was due to a denture rubbing a bit in that area. It is almost certain that the "floor of the mouth" under the tongue would feel very firm to press with a finger, whereas normally it feels very soft. Another advanced tongue tumor, underneath the tongue. This is a very early stage cancer. You might think it looks like a tongue ulcer - and it does! BUT the clue that something is not right is the fact that it DOES NOT HEAL UP WITHIN 10 DAYS. This is yet another advanced cancer on the side of the tongue. This a nasty-looking tumor affecting the area UNDER the tongue and the floor of the mouth; major tongue surgery was needed here to save the patient's life. This cancer has grown along the entire right-side of the tongue. It's very red, almost to the tip of the tongue. These tongue cancer pictures show how tongue cancers have many different appearances and locations. 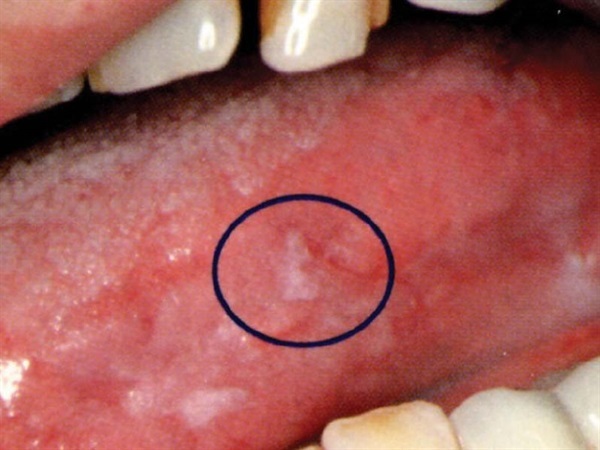 The most common is probably on the side of the tongue, as a small dent or ulcer with red edges and white speckles in the center. The main causes of tongue cancer are smoking, and drinking alcohol. Either one of these on it's own will increase your risk of getting a tongue cancer. But if you smoke AND drink alcohol (especially stronger liquor like whisky rather than beer), your risks are multiplied. Also, you can read more about tumors affecting the jaws at Jaw Bone Cancer, and also about how doctors assess the "stage" that a tumor has reached at the Stage 3 Cancer page. I hope that showing tongue cancer pictures like these will provoke at least one person out there to go to their dentist or doctor to get a persistent ulcer on their tongue checked out. The earlier you get treatment, the easier and quicker it is. Photos of tongue cancer are not nice to look at, but it could save your life. ALWAYS get an ulcer checked if it doesn't heal in 7 to 10 days.